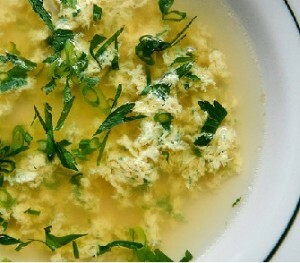 Stracciatella Alla Romana:Stracciatella alla romana is the name of an Italian egg drop soup which is popular around Rome, where it invariably used to be served at the start of Easter lunches. Stracciatella alla romana is traditionally prepared by beating eggs and mixing in grated parmesan cheese, salt, pepper, nutmeg, lemon zest, and sometimes semolina; this mixture is then gently drizzled into boiling meat broth, while stirring so as to produce little shreds (“stracciatelle”) of cooked egg in the soup. Bring the chicken stock to the boil in a saucepan and let it simmer. Whisk the eggs, cheese and parsley in a bowl. Season the egg mixture with salt, pepper and nutmeg. Add about 1/3 of the egg mixture to the soup, while continuously whisking, to make shreds of eggs. Add remaining eggs in 2 more batches, letting the soup return to a boil between additions. Once all of the eggs have been added, bring soup to a final boil and use the whisk to break up any large clusters of eggs. Gently stir in the butter. Stracciatella alla romana is ready to be served.